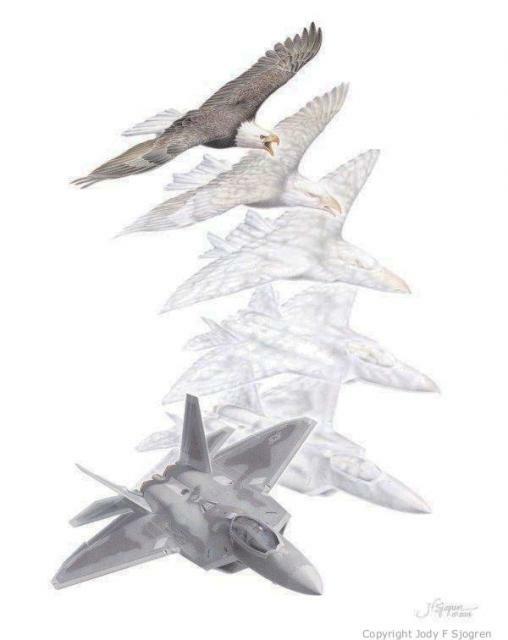 Inspired by the majestic power of the Bald Eagle and the technological wonders of the F-22 Raptor, artist Jody F. Sjogren captures the association between these two “dominant raptors” of the skies. Who has not marveled at this great American bird of prey on the wing, or pondered the fierce force of its curved talons and hooked beak? Wherever it flies, Haliaeetus leucocephalus dominates its territory. Above all other raptors (eagles, hawks, falcons, and owls), it reigns as America’s symbol of national pride and strength. In military parallel, Lockheed Martin’s F-22 Raptor guarantees “air dominance” in aerial warfare. As the first of the United States Air Force’s fifth-generation fighter aircraft, the F-22 prevents hostile aircraft and missiles from denying U.S. operations worldwide, day or night. The Raptor’s combination of maneuverability, speed, stealth, integrated avionics, and supportability multiplies its advantages in both air-to-air and air-to-ground environments. In any airspace and any situation, the F-22 gives its pilot unsurpassed control of the engagement. By the genius of its designers, it has become – like its living counterpart put here by our Creator - the dominant raptor of the skies.